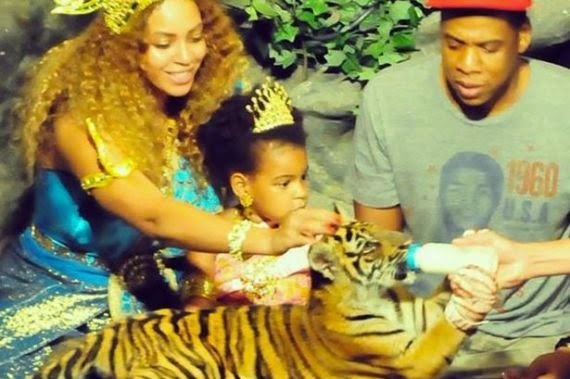 The couple Beyonce and Jay Z are on holiday in Thailand with their daughter, Blue Ivy, but out of the spotlight until the singer is criticized. This weekend, the singer published in her Instagram page a photo with her husband and daughter while stroking a tiger cub, image that generated great controversy between the wildlife protection organizations, such as One Green Planet and the World Animal Protection. The expert in wildlife, Dr. Jan Schmidt-Burbach, stated that "Tigers are not dolls," and that many tourists are not aware of the abuse that animals receive just by being there. "The health and welfare of these animals should not be sacrificed for a picture. When you look behind the scenes, festive images like this support an industry that is based on cruelty," said the doctor. "These people don’t know that this 'unique opportunity' to take a picture means a life of misery for the animals," he added. "This sordid side of tourism is conveniently hidden from public view."